Then again, he is a showman of no mean talents. So if there is a maquette of Fannie Mae’s planned new $770 million headquarters somewhere around Washington DC, he could start the sacking right there. Hopefully, he would not hesitate to shatter it with a fusillade of tweets—-or even take a jackhammer to it while wearing a Trump hard hat. Fannie Mae is surely a monument to crony capitalist corruption, and living proof that massive state intervention in credit markets is a recipe for disaster. But rather than shut it down after it helped bring the nation’s financial system to the edge of ruin, the beltway pols have come up with an altogether different idea. To wit, they plan to move Fannie from her already luxurious NW Washington headquarters to a hideous new glass palace to be built in the heart of Washington DC. Could there be a bigger insult to the 15 million families who lost their homes to foreclosure owing to the crash of the giant housing bubble that Fannie Mae and the crony capitalist crooks who ran it helped perpetuate? And that’s to say nothing of the $180 billion of taxpayer money that was pumped into Fannie Mae and the other GSE’s after the house of cards came tumbling down in August 2008. In fact, while the politicians on Capitol Hill have dawdled for eight years without any statutory changes or mandates for even minor reforms, Fannie Mae’s management and its phalanx of K-Street lobbies showed exactly who rules in the Imperial City. It is the larcenous rule of these syndicates of beltway racketeers, in fact, that has put Donald Trump’s name on the Presidential ballot. So let it be granted that his manners and policy knowledge appear to be on the meager side. Yet it is malodorous tales like that of Fannie Mae’s swank new palace which demonstrate why a disrupter on horseback is exactly what the Imperial City deserves. This convenient scam was first invented by Lyndon Johnson to magically shrink his “guns and butter” fiscal deficits. 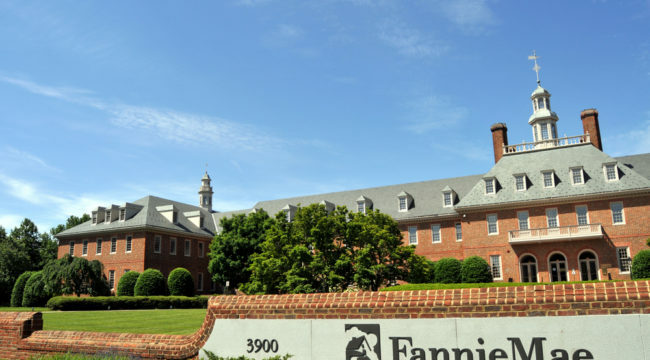 But since then it has metastasized into a giant business fairy tale—namely, that behind the imposing brick façade of Fannie Mae’s soon to be superseded headquarters, as pictured below, there is a real company generating value-added services that are the source of its reported profits. That’s right. It is the unwitting taxpayers of America’s flyover zone who underwrite Fannie’s balance sheet, and enable the racketeers who run it and fed off its massive money shuffling operations to live high on the hog. Here’s how the scam works. Fannie and Freddie typically booked 90% gross profit margins owing to the fact that they have essentially no cost of production beyond the trivial expenses of their automated underwriting systems and highly computerized back-office operations. Their real cost of goods would be the large accounting provisions for future losses that would be required were they not wholly guaranteed by the US Treasury. I laid this out more fully in The Great Deformation, yet the mythology about Fannie and Freddie is virtually immune to these obvious truths. Indeed, the beltway discourse has been so corrupted that a whole new raid on the treasury has been launched by speculators who bought up their worthless securities after the 2008 collapse and subsequent bailout. And now they are pounding the table for a bailout of the remnants of the last bailout. Accordingly, the Obama folks had simply decided to treat the remnants of Freddie/Fannie as a wholly owned government investment fund, and swept back to the US Treasury 100% of the phony “book profits” posted each quarter. But it hasn’t because there is no end to the zero cost-of-goods carry trades by which speculators scoop-up and fund financial assets—busted and not—during the Fed’s money printing marathons. That’s what has been happening since the Fed went all-in on ZIRP and QE in 2009, and this play on the busted securities of Fannie and Freddie is a perfect example. Roughly $50 billion of that was for writing-upa “tax asset” that had earlier been written-down seven year ago, owing to the fact that absent nationalization the GSEs had no prospect of booking even accounting income in the future. During the peak of their campaign to fleece the nation’s taxpayers for the second time around, the leader of the hedge fund gang, Bruce Berkowitz, appeared on CNBC demanding that Washington exercise its “fiduciary responsibility” to distribute billions in paper profits that have not been earned and are not owed. In short, the purportedly well-mannered and knowledgeable politicians of the beltway have sat on their hands for eight years while Wall Street bandits have been launching the blatant raid described above, and while Fannie’s management has been fixing to build and occupy the glass palace also shown above.